Two issues that were surely not on the agenda for C.R. Davis’ in 1933 were questions relating to ‘Business Software’ and ‘ISO Certification’. Both of these topics have been front and center for us over the past few weeks. 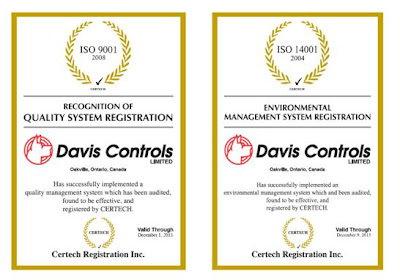 We have been certified to ISO 9000 / 9001 since 1996 and to ISO 14001 since 2007. To be honest, when we first undertook this project, we did it because everyone else was doing it and at the time it appeared that we would be conspicuous if we were not certified. 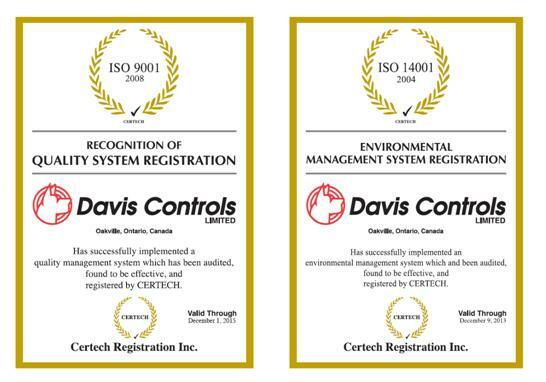 Now however, we continue to maintain and renew our certifications because it makes good business sense for us to do so. 10. Achieved international quality recognition. On the other side of the coin, a common criticism of ISO 9000 / 9001 is the amount of money, time and paperwork required for registration. Opponents claim that certification is only for documentation. Advocates believe that if a company has documented its quality systems, then most of the paperwork has already been completed. Some argue that ISO 9001 is effective as a guideline, but that promoting it as a standard "helps to mislead companies into thinking that certification means better quality, undermining the need for an organization to set its own quality standards." The standard is especially prone to failure when a company is interested in certification before quality and that while "quality has a positive effect on ROI, market share, sales growth, better margins and competitive advantage," that "taking a quality approach is unrelated to ISO 9000 registration.” In fact, ISO itself advises that ISO 9001 can be implemented without certification, simply for the quality benefits that can be achieved. In the end, we have found that it is easier for us to use certification and the tests performed by an external auditor as a way of preventing us from giving ourselves an easy grade. Is it possible to mark your own exam without internal influence and ego? There is something to be said for independent evaluations and that is the route we have chosen to take. 1. Commitment of management to monitor, control and improve quality. Organizations that implement an ISO system without this commitment often cut corners to get a certificate on the wall and ignore problem areas uncovered in the audits. 2. How well the ISO system integrates into current business practices. Some organizations that implement ISO try to make their system fit into a cookie-cutter quality manual instead of creating a manual that documents existing practices and only adds new processes to meet the ISO standard when necessary. 3. How well the ISO system focuses on improving the customer experience. The broadest definition of quality is "Whatever the customer perceives good quality to be." An ISO system should take into account all areas of the customer experience and industry expectations and seek to improve them on a continual basis. 4. How well the auditor finds and communicates areas of improvement. Auditors that can clearly identify and communicate areas of improvement in language that management understands, facilitate action on improvement initiatives by the companies they audit. 5. Having a dedicated, methodical, articulate and professional Quality Assurance Rep on staff to manage and implement the standard and provide leadership for the Quality Committee is essential. By the time my next blog is due, we will have completed a major Business Process System upgrade as a big part of our objective to achieve continuous improvement and I hope to have lots of good things to talk about. If you do not see a new blog in three weeks time, you will know that it didn’t go well.